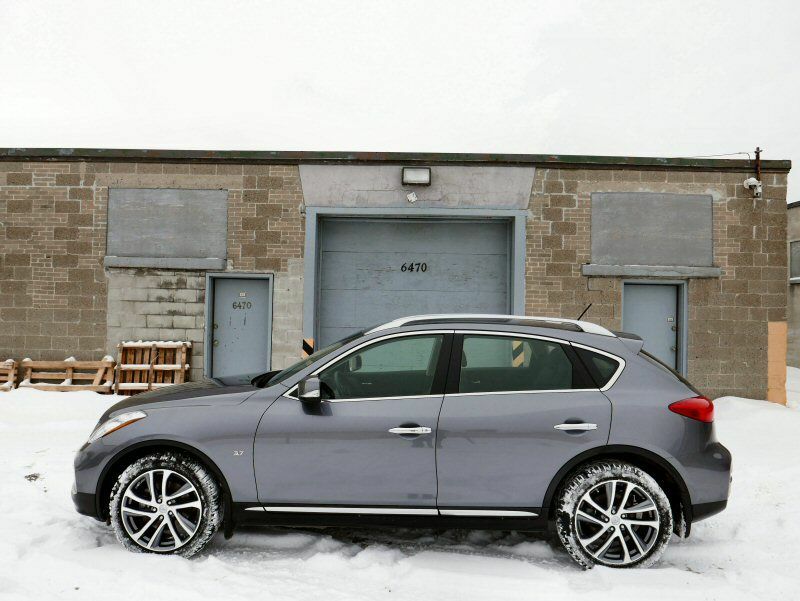 At first glance, the 2016 Infiniti QX50 might not look any different than it did the year before. Get out your yardstick, however, and you'll quickly discover that Infiniti has finally bowed to pressure and stretched the entry-level luxury crossover so as to offer a more accommodating interior. In fact, this is the only major change that's been made to the Infiniti QX50 platform, but it's had the effect of significantly broadening the audience for the vehicle. No longer so cramped as to be strictly "couples-only," after spending a week with the QX50, it's easier for me to recommend adding it to your shopping list in the compact people mover segment - as long as you value performance over outright frugality at the fuel pump. The previous version of the Infiniti QX50 went into battle with other small luxury crossovers with one hand tied behind its back. I can recall a Christmas holiday a few years ago where I made my annual pilgrimage to my parents' rural home behind the wheel of the vehicle, rear seats folded flat and stuffed to the brim with gifts and an ornery cat unhappy to be locked in his carrier. To say that there was barely enough space for even our modest tidings of joy was an understatement: the Infiniti lagged behind smaller hatchbacks like the Volkswagen Golf when it came to cargo room and even passenger space in the second row. For 2016, things have definitely improved. 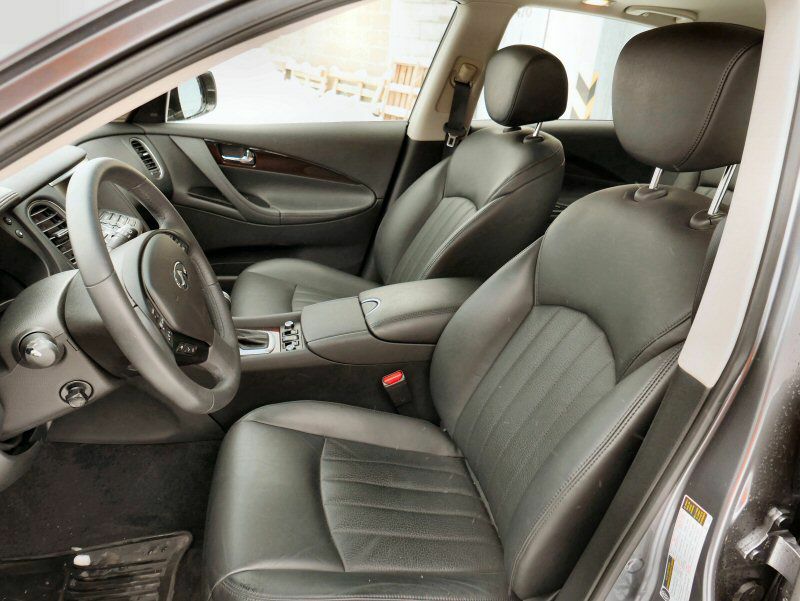 The secret is a 3.2-inch stretch in the Infiniti QX50's wheelbase that, in combination with better management of interior space, translates into 4.3 inches of extra legroom for rear seat riders. Cargo space still trails most of its rivals at 50.1 cubic feet in total - less than three cubes better than before - but at the very least your friends will no longer riot after more than a few miles stuffed into the second row. Pay less, get more? 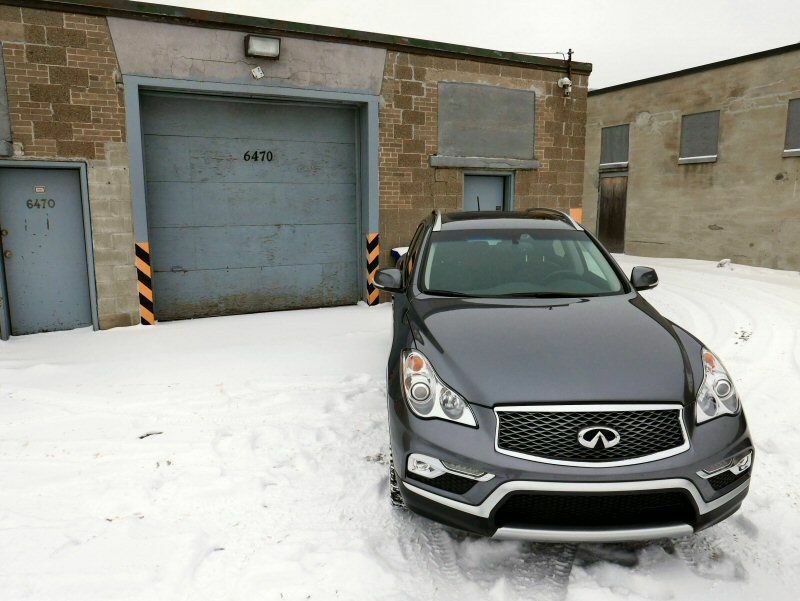 That's the philosophy behind the 2016 Infiniti QX50, which sees its entry-level model priced at just $35,445. This represents a discount of $550 compared to the 2015 model year, which is impressive considering that not only is the new QX50 larger inside but that it now adds heated seats and a sunroof as standard equipment. To be honest, chances that you'd be able to find a base model of the crossover on any Infiniti lot are fairly low - there are four options packages available with the vehicle, and all-wheel drive is going to be bundled into most versions of the QX50 - but it's an interesting pricing move intended to stoke customer interest in a hauler most people may have forgotten about. The extra 4.3 inches of total length that have been grafted onto the 2016 Infiniti QX50 haven't had much of an impact on its styling. You'd be hard pressed to tell the new model apart from the old one, although Infiniti has added a few additional design elements intended to set the two apart. Most notable is the inclusion of LED daytime running lights up front, a move which helps keep the QX50 looking modern despite lacking the gaping maw that has become de rigueur across the brand's crossover landscape. Other than that, you get what I like to call "stealth wagon" looks from the Infiniti, what with its sloped roofline, its somewhat tall ground clearance, and its car-like proportions. If it were politically correct for the Japanese brand to have a wagon in its showrooms, and not have to toe the line for SUV-hungry shoppers, you can be it would look a heck of a lot like the QX50. Whereas some luxury crossovers pay lip service to the concept of performance, the 2016 Infiniti QX50 truly delivers - and it does so at considerably less cost that most of its German rivals. All versions of the QX50 are outfitted with the same 3.7-liter V-6 engine, which is good for 325 horsepower and 267 lb-ft of torque. When matched up with the Infiniti's standard seven-speed automatic transmission, this is enough to launch the crossover to 60 mph in just six seconds. 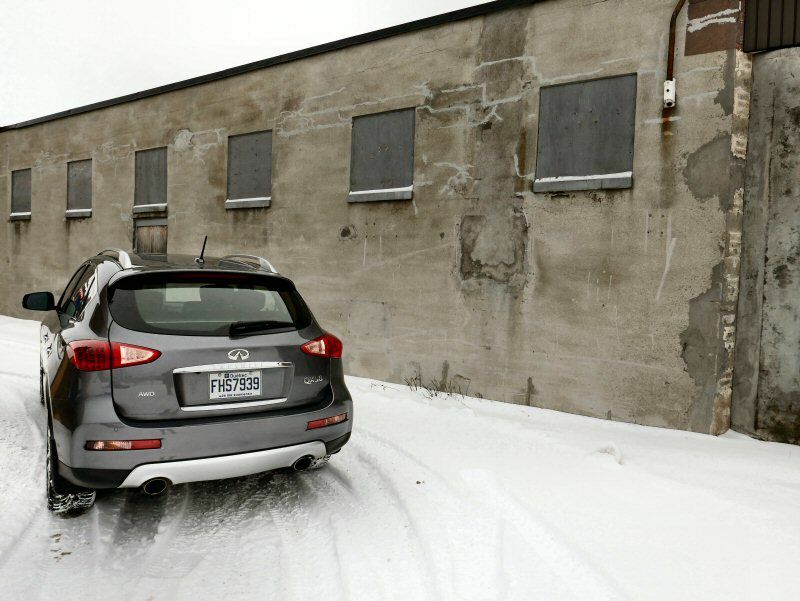 What I found more impressive than the QX50's decent straight-line speed, however, was just how lithe its chassis felt on the snow-covered country roads that separated my partner and I from the bed and breakfast we had booked for a weekend getaway. Despite a curb weight that hovers around 4,000 lbs - roughly what one would expect from a mid-size premium sedan - the Infiniti was willing to dance through the corners and hang its tail out in the white stuff in a manner few other crossovers would be willing to attempt. 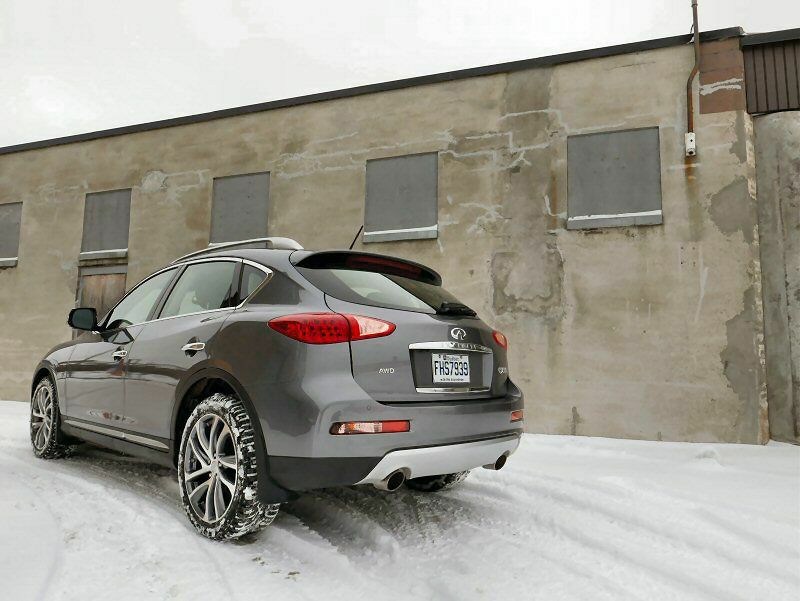 This speaks to the rear-wheel drive roots of the QX50's platform, with even all-wheel drive models like the one I drove featuring a pleasing back-axle torque bias. 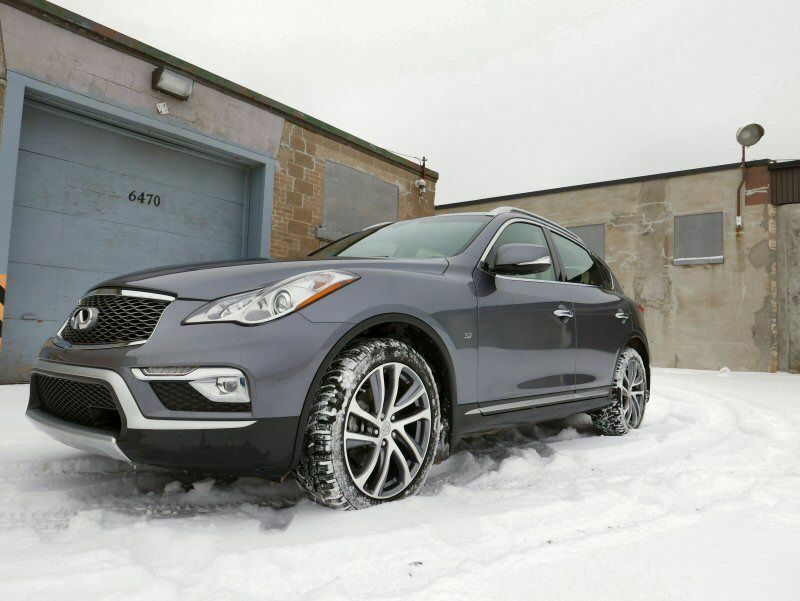 I also had the chance to use the vehicle's 50/50 torque lock setting when advancing up a steep, twisting driveway coated in two inches of snow, and found that the Infiniti had no issue dealing with the treacherous conditions. 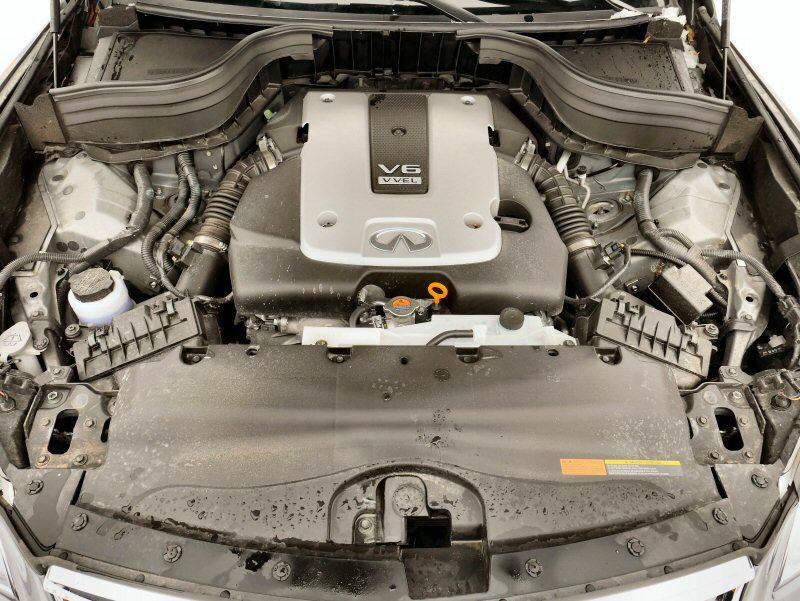 There's a price to pay for the 2016 Infiniti QX50's boisterous V-6 engine, and it comes due each and every time you fill up at the fuel pump. Regardless of whether rear-wheel or all-wheel drive is selected, the Infiniti QX50's fuel economy is listed at 17 mpg in stop and go driving and 24 mpg on the highway. 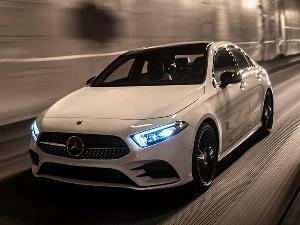 Take a look around at almost any other premium crossover in the compact class and you'll quickly discover that these figures are at least four miles per gallon worse for each respective measure. After a 220-mile trip that consisted of mostly highway driving, I ended up at an average of 17 mpg myself, which is a dismal figure for such a small vehicle. If regular commuting is in the cards, you'll have to ask yourself whether the fun character of the QX50's stout V-6 drivetrain is worth the efficiency sacrifice. "wrong" with the crossover's cabin - but it's worth noting that one of my passengers straight up told me how "old" the vehicle's switchgear and dashboard looked. 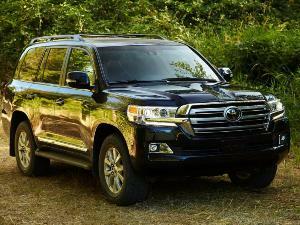 I also fielded complaints about the quality of the leather inside the vehicle. With wood inlays and Infiniti's previous-generation infotainment system in place, it's true that the QX50 looks a bit cluttered and not quite as modern as most other entry-level luxury haulers. This impression is reinforced by the LCD display nestled between the speedometer and tachometer, which comes across as more Nissan than Infiniti. It's the sign of a platform that hasn't been significantly updated - aside from the current stretch, and a larger engine just a few years back - since it was first introduced. Although it might not ride on the latest and greatest platform, the 2016 Infiniti QX50 still makes a valiant effort to provide a number of active safety features. By adding the Technology package to the crossover, buyers benefit from a lane departure warning and prevention system, a blind spot monitoring feature, and a forward collision warning system with automatic braking that works in tandem with adaptive cruise control. During my QX50 road trip I eventually had to turn off the lane departure feature, as it was fairly aggressive about complaining when I got too close to the center line of the highway. 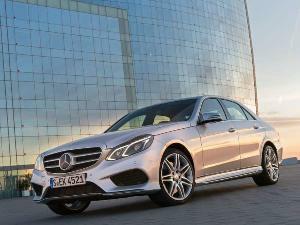 More problematic, however, was the adaptive cruise control system, which straight up didn't work. 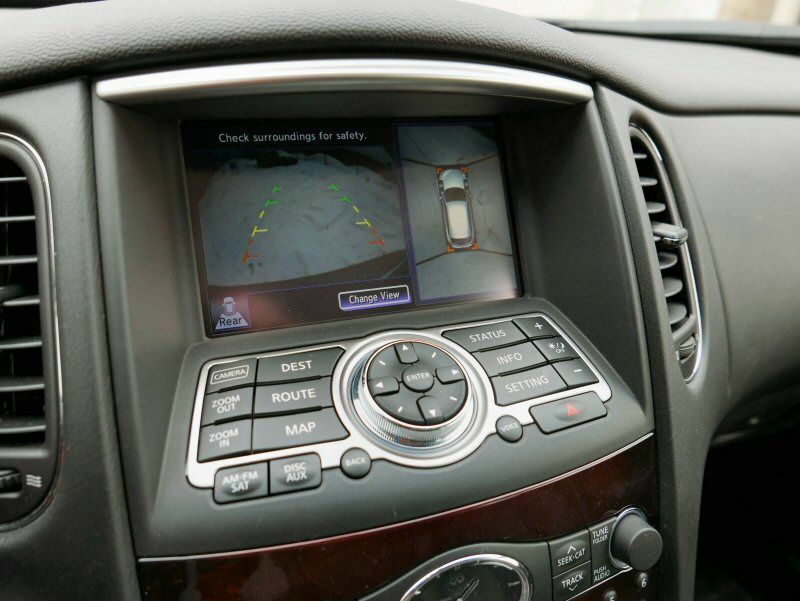 Even though I had the system switched on and the dashboard control showed it as active with full control over the distance I wanted to keep between the Infiniti and the vehicle ahead, it simply didn't work - and worse, there was no warning when I got right up to the bumper of forward traffic. Usually when the forward sensors aren't functional for collision warning or adaptive cruise control, there's at least some indication given to the driver - a warning light, a chime - or the system won't engage at all. Not so with the QX50, which acted as though nothing was wrong even when I was putting the vehicle in harm's way. It's my first time experiencing this type of component failure with Infiniti, but it's worth mentioning as it could have serious consequences out on the highway. The 2016 Infiniti QX50 finds itself occupying a luxury crossover niche that few other automakers have seen fit to populate. 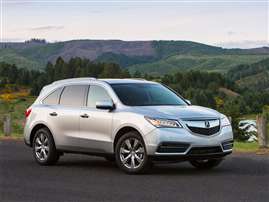 In terms of rear-wheel drive premium people movers, you're looking at either the BMW X3 or the Mercedes-Benz GLC-Class as the closest analogs, and each of these models starts at roughly $3,000 above the QX50 for base models with less power. In fact, only BMW offers output that could be considered competitive with the Infiniti, and to snag it you have to pony up another $10k over and above the QX50's window sticker. Each of these vehicles is much larger inside than the Infiniti when it comes to cargo - and there are several rivals from Audi and Acura that provide similarly spacious, although not as fun-to-drive packages - but none combine the affordability and handling chops of the QX50.